Ryan McGinley never fails to capture a candid side of his subjects and for his latest story in V Magazine McGinley brings out Saskia de Brauw‘s humor and lightness. 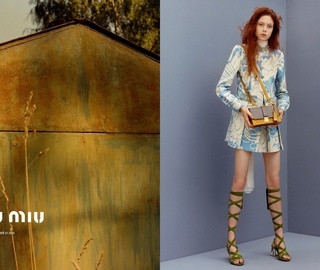 The energetic images styled by Carlyne Cerf De Dudzeele depict Saskia exploring an expansive garden as she sports the latest wares direct from the resort collections. With flowers in her hair and a short blonde bob, Saskia pulls of nymph-chic with a little help from beauty maestros Jimmy Paul and Serge Hodonou. The colorful, floral filled images make for an effervescent editorial that never takes itself too seriously and lets Saskia show yet another side of her versatile persona.